Got a spare two and a half hours? ... then why not spend it watching the version of Macbeth currently available on the BBC iPlayer? 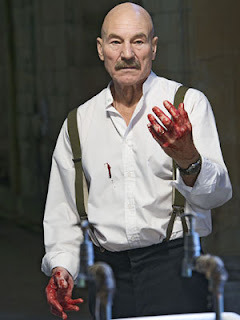 Sir Patrick Stewart is full of the wild strength and will to dominate that makes the ‘hero’ such a fascinating and destructive personality. The ‘age of dictators’ setting works well with the paranoid tyranny of Macbeth’s reign, and the utilitarian backdrop of Welbeck Abbey’s tunnels adds to this atmosphere. Thankfully this doesn’t feel like innovation for its own sake, and the text is clear and virtually unaltered throughout. Shakespeare’s use of language is so incredible, it’s a beautiful thing just to listen to even if you don’t understand every word. When you do, it can sometimes seem like a stream of clichés but that’s because he’s is responsible for so many turns of phrase that we still use today. We heard them here first. There are a few weak spots: fate’s mastery over all is hard to communicate in a modern context to a modern audience, and Lady Macbeth is played better when she is being crushed by her husband’s megalomania and her own guilt than when she is a decisive co-conspirator. That said, it’s a really good production and a rare enough taste of the finer arts on TV.